That punchline panel is every office I’ve ever worked in. Just saying. No doubt you’ve already read (watched the video for) in the news about robot cats, robot boxes, deadly lakes turning animals into statues, and jumping water being used to power everything in the future. So, I’ll move on to other things. Decrypting Rita, a comic by Egypt Urnash, is a sci-fi adventure, well written and very interestingly drawn (realistically rendered, but no lines, just shapes). Egypt is running a Kickstarter for her second book in the series, so check that out too. Oh, and my friend (and often cohort) did another amazing instructable, this time how to make Josef The Robot (from “Machinarium”) out of little pieces of junk you can get at the hardware store. (I don’t really play videogames, but have watched the trailer for “Machinarium”, astoundingly pretty). Had a good week. Worked, went on a short hike, played some racquetball, went on some walks (and managed not to get rained on), popped in to the local gallery to see the show (although I wasn’t able to make the opening). I also put in a “new” door. You see, we live in a rental with a screened in porch, which is GREAT for our cats (who are indoor cats). So, our landlord (understandably) didn’t want us to put a hold in the door to the porch to put in a cat door, so my girlfriend and I went to the architectural salvage yard in Albany and found one somewhat the same size. I had to cut off a few inches on the bottom, and add a little to the side (the door was labeled as being wider than it was, sadly), and put in the cat flap, put in an insulated seal, and voilà. It ended out coming pretty good. Now, we’ve just got to train them all to use it. Wanna train cats to use the door? Put canned food (shrimp derived is usually best) on the opposite side. Who *else* but Emily would just walk around all the time in space vehicle with clothing that converts into a space suit! sheesh for a moment there I thought it was Treatment treatment and that got me worked up a little. @Corpore, I imagine that’s standard issue for security people and maintenance people who may need to make emergency EVAs, when normal “suiting up” would cost lives, including their own. The suits for security people differ from the ones for maintenance people mostly with the inclusion of a Makarov pistol for defense and propulsion. And condoms, of course. Cute lil smiley on the missle (turn 100 degrees). I feel that a visual joke with getting her hair rapidly crammed into that helmet has been missed. Prop the door open with a clothespin, and then gradually make the opening smaller and smaller so they get used to having to push through. I think… that you forgot to draw the condom in Emily’s hair in the first and third panels. Also, the third panel in the previous page. Might be more fun drawing it being sucked into space! Unless… I should have assumed that she got rid of it? You know, I realize that the main SpaceTrawler story is over (*snf* Martina), but I’ll take all of the Emily and Pierrot space opera that you feel like dishing out. Love the new door for the cat door! I was happy that i was there to monitor the cats when they were figuring out how to use the cat door. 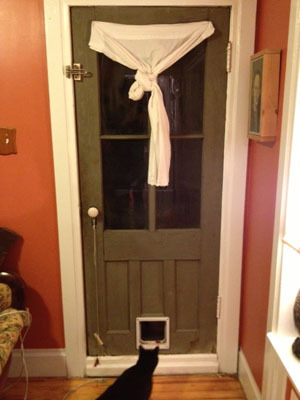 (We had installed a cat door with a rigid flap leading to the garage.) The cleverest cat thought the proper way to open the door was similar to opening the big human door – push paw through, hook door with paw, pull door towards self. Poor thing had her paw caught and pinched hard; her struggles to get free (yanking paw more and more furiously towards herself) made it worse. I was sitting close enough to jump right up, free her, and give her kitty treats. Much to my relief, she wasn’t scared of the door afterwards. She’s very clear now that you go through it by just pushing with paws and head.